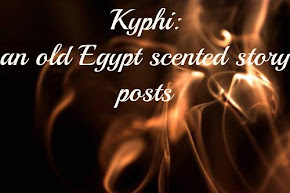 After I wrote about Kyphi, what was and what was its use, about the ingredients and their smell, here is the recipe of the Egyptian Sacred Incense as I made it. The ingredients (see Kyphi part 3) quantity are calculated to give at the end of the preparation almost 500 grams of the Holy Incense. 10) in the mortar grind finely 60 grams of myrrh; the mix in the same pan as point 9 MIX6 and MIX7 and always at low flame, homogeneize all (MIX8) : this is a very difficult operation because of the high plasticity of the 2 mixes. Once you have MIX8, add the myrrh and fold well into the compound. Start now the second phase of preparation of Kyphi: the drying of the product. This is a very slow process and can last from several weeks to months. This dark paste has to be reduced in small balls of about 1 cm of diameter to be good to be burned and with the compound already done is not easy. So we go on by degrees, starting to make balls of the size of an egg. Then we leave it dry the external surface for 2-3 days and then we make again smaller balls, paying attention to the stickyness that has to be always less and less as time pass. My Kyphi today has a very high degree of dryness, even if some of the small balls is still soft, as the drying is still not perfect. Another part is ready to be burned in the small censer and the developed smell description and final remarks will be the subject of the coming post. 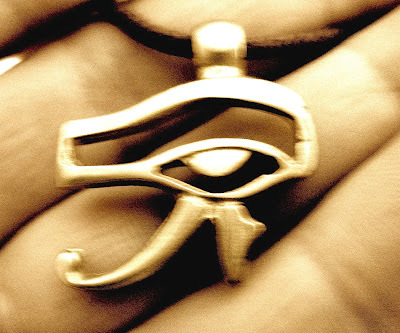 "..TO THE EYE OF HORUS THAT GUIDE MY HAND AS I HAD THE CHANCE TO MAKE THIS TRUE EXPERIENCE AND SPREAD THE POWER OF KYPHI AGAIN.."
Wow, what a process! So what does it actually smell like in the end? Is it worth the amount of work involved? I soooooo want to be able to smell it! the dryness grade of the kyphi can vary the olfactive experience.. Thank you for sharing this process...I am sure I have made this before...in my Egyptian lifetimes. What a gift..would love to be there to experience the process with you..
Now you are killing me... I'd like to try and smell it! ~~~~~~~~~Eileen Jackson-perfume aprentice with Anya McCoy :) and refered by Jose Perez via FB. Thank you so much you are an Perfume Artist!